We all know the importance of eating well. Especially when you’re pregnant! The foods you eat are literally what builds your baby. Have you ever felt unsure though? Unsure of what to avoid, and what to limit? Unsure of which foods are going to be the best ones that guarantee your little one gets all of the vitamins, minerals, and nutrients they need to develop properly? I was recently sent a book called ‘Real Food for Pregnancy’ by Lily Nichols. 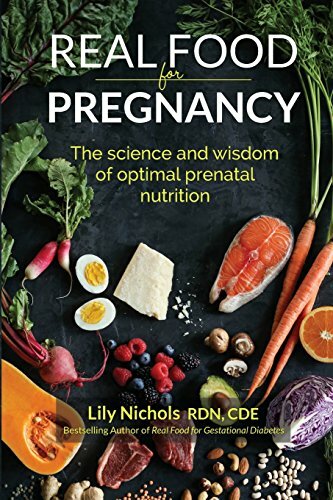 Lily is a registered dietician/nutritionist, certified diabetes educator, pilates lover, researcher & author, whose previous book ‘Real Food for Gestational Diabetes’ has influenced nutrition policies internationally. In this book, you will find the answer to any pregnancy-related diet question. I’m not kidding, the book has it all, including a bunch of fabulous looking recipes (hello, that Electrolyte Replenishment Drink sounds phenomenal tasting, super hydrating, & excellent to have during labour!) in the back. And pages & pages of references to medical journals, studies, and papers citing the information she used to write this super comprehensive tome. ‘Real Food for Pregnancy’ covers subjects such as high blood pressure, the glucose test (& alternatives to it), what foods you need and why (like Liver for that amazing folate! ), why to avoid certain foods like artificial sweeteners (people who consume them are in fact more likely to have blood sugar problems), how to combine different foods to make them work better for your body, exercise, and even pregnancy spacing (this one was news to me! Waiting until your child is 18 months old before conceiving again correlates with lower rates of preterm birth, neural tube defects, autism, & infant loss. It’s because your body hasn’t rebuilt it’s nutrient stores in that time frame! Fascinating stuff.). The purpose of this book is to take prenatal nutrition out of the dark ages. I believe it’s high time for women to take their health into their own hands. We don’t need any more outdated charts on what foods to consume in what quantities. We need to learn for ourselves (with the help of a woman who has made it her life’s work) how to ensure positive outcomes for not only our own health, but the health of our babies. This book is a must-read for any pregnant woman, or educator/helper of pregnant women. Thank you for the book, Lily! It’s a great tool to have in my arsenal, and I will for sure be adding it to my lending library.